Muslims all over the world are celebrating Eid-ul-Adha, the ‘festival of sacrifice’ or the Greater Eid. The other Eid, Eid-ul-Fitr is the festival which marks the end of Ramadan, the month of fasting. This is when many Muslims pay their annual zakat – a religious tax equivalent to 2.5 percent of a person’s wealth each year. 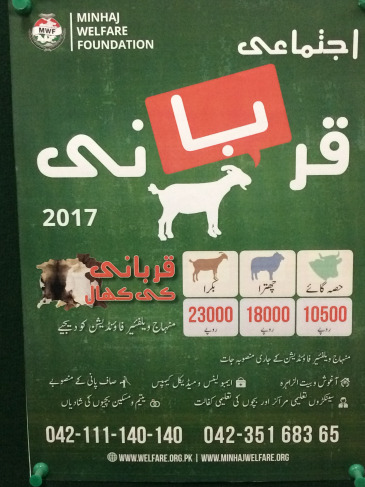 Meanwhile, in conjunction with Eid-ul-Adha, Muslims worldwide conduct qurbani, sacrificing a goat, sheep, cow or camel, where a third of the meat is distributed to the poor or vulnerable. The sale of animal skins, donated by individuals after the ritual sacrifice, is a major source of income for many charity, welfare, and aid organizations. Religious festivals in Islam often involve distribution of food and donations to help people in need. Contributing to social justice through the redistribution of wealth is a central tenet of Islam and is implemented by requiring those who are able, to share their wealth. These transactions are private affairs and, according to the Quran, must be conducted discreetly. Accordingly, it is difficult to know how much money is actually involved. But estimates suggest Muslim charity amounted to US$ 2tn (2015) and is on the rise. Even the lowest estimates of Muslim giving globally put the figures at 15 times the global total of official humanitarian aid in 2011. Religious alms-giving is often criticized for failing to support long-term, sustainable development. Our research among Muslims in Norway and Pakistan shows, however, that many Muslims are keen to give to organizations and initiatives designed to achieve lasting change in people’s lives, for example through funding education. Many are also concerned about sustainable development. This can be seen as part of a global trend, as Muslim actors have become increasingly prominent internationally in the areas of development and humanitarian aid. Institutions such as the Islamic Development Bank (IDB) and Muslim NGOs are signing up to the UN Sustainable Development Goals. This is a new trend, but what does it mean? By adopting the 17 Sustainable Development Goals, the international community set itself targets for the period to 2030 in connection with combating poverty, promoting sustainable and inclusive economic growth and social development, protecting the environment, and supporting peaceful, just and inclusive societies. Meeting these targets demands enormous resources. Meanwhile, international aid is declining. To attain the Sustainable Development Goals, international, national, and local actors must collaborate in new ways. New partnerships between religious and secular actors, and between the private and public sectors, will be essential to achieving the goals. The Islamic banking and finance sector emerged during the 1970s and in recent decades has experienced enormous growth. The sector is well established in countries such as Malaysia, Indonesia and Pakistan, and also in the United Kingdom. Ongoing research, in which we are participating, is investigating attitudes to Islamic finance among Muslims in the Nordic countries. Briefly, Islamic finance is about conducting financial transactions in accordance with Sharia (Islamic law). Sharia is interpreted in various ways, but usually entails a ban on traditional ways of charging interest, along with speculative and unethical investments. The latter rules are similar to those governing ethical finance, and some Muslims prefer the term ‘ethical finance’ to ‘Islamic finance’. At the same time, there is debate over what is ‘Islamic’ about Islamic finance, and to what extent Islamic banks can form part of global finance markets, in which interest-based profit is such an integral component. Regardless of these disagreements, Islamic finance is one of the fastest growing segments in the financial sector worldwide. According to some studies, the sector has experienced a ten-fold growth in volume since 2000. The Islamic finance sector is thus potentially important for investments in infrastructure, health and education, and thus highly relevant to ambitions to achieve the Sustainable Development Goals. Efforts to achieve the Sustainable Development Goals demand new global cooperation, with new partnerships and sources of finance. Islamic finance is just such a new and potentially important source of finance in the global arena. Established development actors both in Norway, in Europe, and globally, should become more aware of Islamic finance, and aid from Muslim countries and private individuals. These are resources that already make an important contribution to achieving the Sustainable Development Goals. As such, Islamic finance is an area that deserves more attention, including both critical scrutiny and interest in developing competence so as to enable better cooperation with new actors within this sector. At a time when faith in multilateral solutions to global challenges appears to be increasingly pressed, yet ever more necessary, new partnerships are worth exploring.